This delicious meatball recipe is inspired by the traditional Moroccan tagine, or slow-cooked stew. Using minced meat instead of shanks more than halves the cooking time. The meat is tender and the sauce is rich and spicy. Look out for Moroccan spice mix at the supermarket or ‘ras el hanout’ at specialty food stores. You can cook this dish equally well in an ovenproof dish covered with tin foil if you do not have a clay tagine. In a large bowl, mix together lamb mince, spice mix, breadcrumbs and egg yolk. Get in there and use your hands! Shape meatballs from a tablespoonful of mixture rolled in the palm of your hands. Then roll each ball in flour that you have seasoned with salt and pepper. The flour coating will seal the balls and also help thicken the sauce. Heat oil in a non-stick frying-pan and brown meatballs gently on all sides for 10 minutes. 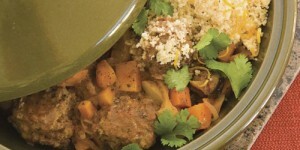 Place in tagine or covered casserole dish and prepare sauce. For sauce, heat oil in a frying-pan and gently sauté onion and garlic until softened, before adding remaining sauce ingredients. Simmer for 5–10 minutes. Pour sauce over meatballs and cover tagine before baking in a moderate oven for 30 minutes to enable flavours to develop. Ten minutes before tagine is cooked, put couscous with salt and pepper to taste into a large bowl and stir in boiling water. Cover with a tea towel and leave to soak for 10 minutes. Add a knob of butter and fresh herbs to taste. Heap couscous directly into tagine and serve at the table.